This book explores the profound social, cultural, and political changes that affected the way in which Canadians and Australians defined themselves as a "people" from the late nineteenth century to the 1970s. Taking as its central theme the way each country responded to the introduction of new migrants, the book asks a key historical question: why and how did multiculturalism replace Britishness as the defining idea of community for English-speaking Canada and Australia, and what does this say about their respective experiences of nationalism in the twentieth century? 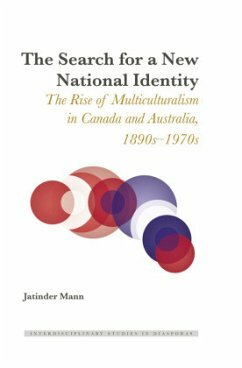 The book begins from a simple premise - namely, that the path towards the adoption of multiculturalism as the orthodox way of defining national community in English-speaking Canada and Australia in the latter half of the twentieth century was both uncertain and unsteady. It followed a period in which both nations had looked first and foremost to Britain to define their national self-image. In both nations, however, following the breakdown of their more formal and institutional ties to the 'mother-country' in the post-war period there was a crisis of national meaning, and policy makers and politicians moved quickly to fill the void with a new idea of the nation, one that was the very antithesis to the White, monolithic idea of Britishness. This book will be useful for both history and politics courses in Australia and Canada, as well as internationally. Jatinder Mann is a Banting Postdoctoral Fellow in the Department of Political Science at the University of Alberta. He has published numerous articles in front-ranking, interdisciplinary journals and is co-editor of Documents on Australian Foreign Policy on War and Peace, 1914-1919, which will be published in 2017. Mann was awarded his doctorate in history at the University of Sydney. He was also a recipient of the prestigious Endeavour International Postgraduate Research Scholarship by the Australian Government and an International Postgraduate Award by the University of Sydney for his doctoral research. Contents: Assimilation Policy in Canada, 1890s-1953 - Integration Policy in Canada, 1953-1963 - The Introduction of a Multicultural Policy in Canada, 1963-1971 - Assimilation Policy in Australia, 1890s-1962 - Integration Policy in Australia, 1962-1972 - The Introduction of a Multicultural Policy in Australia, 1972-1978 - "Anglo-conformity and Incorporation into the Anglo-Celtic Culture": A Comparison of Assimilation Policies in Canada and Australia, 1890s-1960s - "Retaining Migrant Cultures" and "Leavening British Traditions": A Comparison of Integration Policies in Canada and Australia, 1950s-1970s - "Multiculturalism within a Bilingual Framework" and "A Cohesive, United, Multicultural Nation": A Comparison of the Introduction of Multicultural Policies in Canada and Australia, 1960s-1970s.